Pumpkin seeds are not considered to be a highly allergenic food such as sesame or other seeds. In fact, according to the U.S. National Library of Medicine, allergies to pumpkin seeds are rare. Still, you may develop an allergy to pumpkin seeds if you are particularly sensitive to pumpkin. As with any type of food allergy, an allergy to pumpkin seeds requires treatment, especially at the onset of an allergic reaction. Pumpkin seeds have increased in popularity and are used in salads, appetizers and breads as well as toppings on main courses. Pumpkin seeds are also ground up and combined with water to create fishing bait. The U.S. National Library of Medicine reports that fishermen who are regularly exposed to bait derived from pumpkin seeds are more likely to develop pumpkin seed allergies. 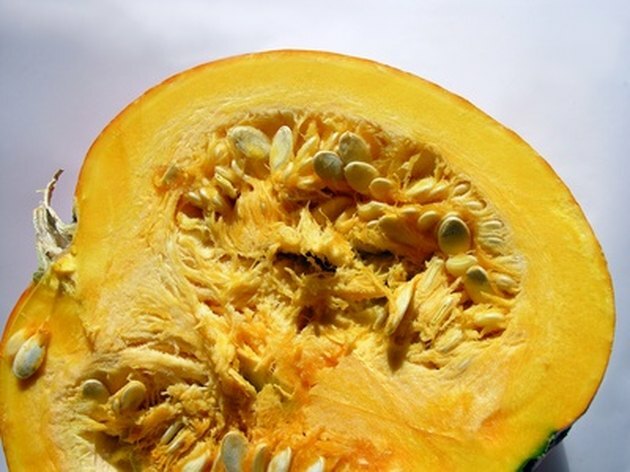 Sensitivity to other seeds can also increase your risk of pumpkin seed allergies. Allergies to pumpkin seeds primarily affect your skin. You may develop a skin rash such as eczema from consuming the seeds or by coming into contact with them. Eczema causes red, raised and scaly areas of skin. Your body may itch after eating pumpkin seeds, and your neck and mouth can swell. Pumpkin seed allergies may cause rhinoconjunctivitis symptoms such as sneezing and nasal congestion. According to InmmunoCAP, severe cases of pumpkin seed allergy may even cause allergic asthma. During an asthma attack, you experience breathing difficulties such as wheezing, shortness of breath and coughing. If you experience symptoms after consuming pumpkin seeds, see an allergist for testing. Allergies are sometimes tested through your blood, but the most common form of allergy testing is through skin pricks. An allergist will take liquid extracts of an allergen and prick your skin. An allergic reaction is evident if a red bump appears where the skin was pricked. Your allergist will likely test for other allergens during the skin tests such as grasses and pollen. Once an allergist confirms that you have pumpkin seed allergy, the best way to avoid symptoms is by avoiding the seeds altogether. Do not use pumpkin seeds in cooking and avoid them when eating out. However, this may be difficult because the seeds are relatively small and are used as an ingredient in different dishes. Obtain a list of ingredients at restaurants to prevent pumpkin-seed-laden dishes. If you experience a severe reaction from eating pumpkin seeds, seek emergency help. At the hospital, a nurse will inject you with an epinephrine, or adrenaline, shot to help keep the reaction at bay. Pumpkin seed allergies are not common. If you suspect this type of allergy, you must seek medical care immediately. Food allergies can cause your body to go into shock, a condition also known as anaphylaxis. Body shocks can be fatal. Also keep in mind that an allergy to one type of food may make you sensitive to another in the same family. According to ImmunoCAP, people who are allergic to pumpkin seeds may also be sensitive to cucumbers, zucchini, muskmelon and watermelon.